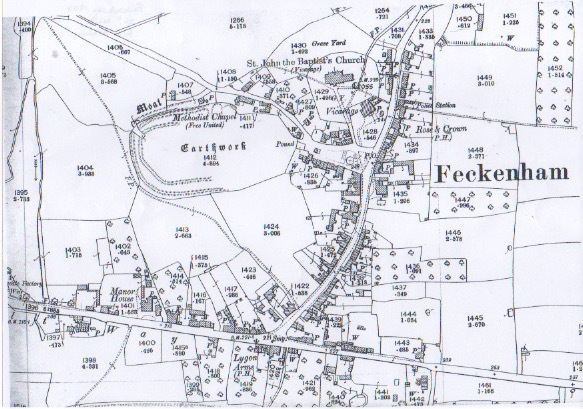 In 1911 (the closest census to the start of World War 1 in 1914), Feckenham housed around 145 families. Within 7 years, many of those families had someone sign up to fight. By 1919, around 20 households had lost their fathers and sons, and a generation of friends and neighbours were also lost. Feckenham 100 years ago was changing from being a mostly rural parish with land owned by around 63 different owners, to a parish of about 6,654 acres owned mainly by 6 people. According to the census, most residents were employed within the needle and fish hook industry, with the main employers being based in the village. John English and Co. had a factory based on the High Street and W. W. Gould and Sons owned two mills, one on the Droitwich Road and the other at the bottom of Mill Lane. 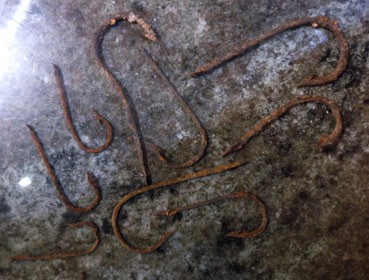 Fish hooks made by W. W. Gould; discovered by Enid Whitehead when restoring the water wheel at Brook House, Droitwich Road. However, a similar amount of residents worked in various agricultural roles; farm labourers, shepherds and hay cutters to name but a few. After these, many of the residents, particularly men, were employed by the cycle factory in the nearby town. A lot of families living on the High Street ran shops of various kinds. Some jobs I noted on the census – which were likely to be shops – were: a baker and confectioner, grocer, newsagent, printers, boot and shoe maker, saddler, dressmaker, blacksmith, butchers and coal dealers. As for the social side of the village, much of the activities were centred around the church and its festivals. Such as the Patronal Festival with the village fete and the Harvest Festival, both of which are still major social events in the village. 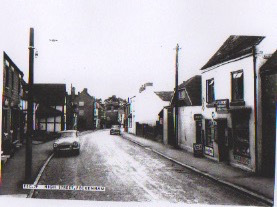 There were also two pubs which still exist in the village today – The Rose & Crown and The Forest (then the Lygon Arms) – and two inns called the Yew Tree and The Eight Bells. Alongside this the red coated local Worcestershire hunt brought crowds of people out with their horses and beagles meeting 2 or 3 times every year. The village school, with around 100 – 125 pupils, would also occasionally hold events. There are also records of a horticultural society in the village. Listen to “Feckenham Flashbacks” on the Audio Walk page for more. N.B. All information is believed to be correct at the time of recording. However, since then I have learned of an extra inn in the village, therefore stating there were 4 pubs and inns on this webpage but only 3 in the recording.